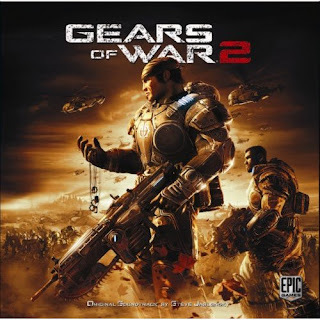 Home » contest , gears of war , gears of war 2 , music , soundtrack , steve jablonsky , The Knight Shift , video games » THE KNIGHT SHIFT CONTEST: Win a copy of GEARS OF WAR 2: THE SOUNDTRACK signed by Steve Jablonsky! THE KNIGHT SHIFT CONTEST: Win a copy of GEARS OF WAR 2: THE SOUNDTRACK signed by Steve Jablonsky! There's been resounding agreement across the board that Gears of War 2 is the must-play video game of 2008. The sequel to Epic Games' 2006 smash hit original is impressing people all over the place with its groundbreaking combo of technical achievement, poignant storytelling, and the hope and heroism and humor that's come to be expected from the Gears of War franchise. And now The Knight Shift blog is pleased to announce that we are going to give away THREE COPIES of the Gears of War 2: The Soundtrack CD... signed by composer Steve Jablonsky! So, you want one? Groovy! But like everything else with Gears of War, you’re gonna have to earn this. But don't worry: you won't have to chainsaw your way to goryglory this time. 1. E-mail your entry to theknightshift@gmail.com with GEARS OF WAR 2 SOUNDTRACK CONTEST in the subject line. GEARS OF WAR 2 SOUNDTRACK has to be in the subject line. 3. And then, attach a photo of yourself doing your best impersonation of a Gears of War character. It can be anyone from established Gears of War canon (the games, the comic book, the novel Gears of War: Aspho Fields but you'll have to be especially imaginative, anything that's been authorized by Epic Games as being legit part of the Gears of War mythology). Keep in mind that this is not a costume contest! If you're the kind of person who likes to parade around Comic-Con and Dragon-Con wearing a full set of COG Gear armor, you're more than welcome to pose wearing that. But this is all about character. This is a contest focusing on raw persona. In short: do you "get" what Gears of War is all about? Can you make that come across with nothing more than your own countenance? If so, pick a Gears of War character and show us what you got! Doesn't matter if you're male or female: plop on a do-rag and show us your best Marcus Fenix mug. Or give us Dom or Anya or Baird or Cole or Dizzy or Tai (ooh-boy I'm eager to see if anyone attempts Tai) or heck, even a Locust grub or the Locust Queen herself! Extra points will be given toward creativity and originality, but as I said this is about channeling character more than it is about costume ingenuity. Also, please try to keep your image size to 1 megabyte or less. 4. No age limit but this contest will enforce a "one entry per person" limit. So like shootin' a gun in a Gears of War game, make it count! 5. You'll have between now and until 12:01 a.m. Pacific Standard Time on December 18th, 2008 to e-mail in your entry, so that gives you a bit more than two weeks to come up with something. 6. Judging for the contest will be conducted by a three-member panel that has already been pre-selected. Their decisions are final. 8. In addition to the three final winners, this blog reserves the right to also publish "honorable mentions" if there are any. 9. Insofar as real life will cooperate, the winners will be announced sometime on December 19th 2008 and the signed CDs will be rushed to each of the winners as soon as possible. Also, please bear in mind that this isn't a contest run by Epic Games or Sumthing Else Music Works or Microsoft or any other corporate entity. Neither am I personally profiting from it as the guy who runs the blog. This is just something that we thought would be way fun to do, for everyone who chooses to get involved.